A Goldenrod Spider sits on a red rose flower in a Pembroke yard. 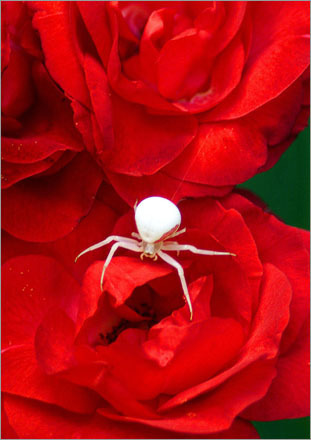 The spider is capable of changing color to suit its background. It emerged from the white center of the rose where it waits for prey. It is a member of the Crab Spider family and gets its name because the goldenrod is a favorite flower to sit on.